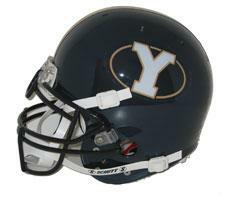 Brigham Young Cougars-(BYU) OLD LOGO Full Size Authentic Helmet by Schutt | Sports Memorabilia! Brigham Young Cougars-(BYU) Full Size Authentic Helmet by Schutt. This helmet is the same design and makeup as those used on the field, complete with real padding, chinstraps, authentic colors and decals. This helmet is an Officially Licensed Collegiate product.